All Aboard for Fun at the Katy Train Room! Hey kids - Our youth room is full of fun activities and a lot of great railroad information, too. But if you can't make here to play, you can still enjoy these fun games online! The Sedalia Heritage Foundation is creating the W.S. Stevens Toy and Model Train exhibit that will become the center of a seasonal youth-based railroad-themed education center. 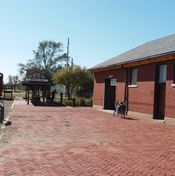 SHF is partnering with the Division of State Parks to utilize the north half of the Sedalia MKT Express Building that formerly functioned as the Railway Express Agency office and freight room. 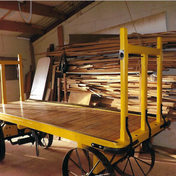 Currently, an impressively large freight cart that was in a very dilapidated condition is being restored as part of the overall exhibit project. It was a Missouri Pacific baggage cart that measures over 12 feet long. See some amazing before and after photos of the restoration project below. All that is left now is to have it re-stenciled with the Mo-Pac livery. An elevated railroad track has also been installed in the REA building and soon train tables will be installed to the delight of children of all ages. The MoPac Caboose is also taking shape with new flooring installed, informational panels created, and kiddie size work tables being custom-made.